Heads up! This is the final installment of a three-part story. If you’re just tuning in, we suggest starting with Part 1 here and Part 2 here. Over the past few weeks, the Switchback crew has been investigating the commercial brewing potential of several varieties of hops found growing wild around Vermont & New England. With the help of the UVM Extension NW Crops & Soils Team, we ran several sensory and analytical tests on the beers we brewed using three different wild hop varieties: Kingdom from Tunbridge, VT, Northfield from Northfield, MA, and Wolcott from Wolcott, VT. After analyzing the test results, the team packed up and headed off to present their findings at 10th Annual Vermont Hop Conference in South Burlington, VT.
Once there, we poured samples of each wild-hopped beer we brewed. Conference attendees were given a tasting sheet and asked to answer four questions: Which sample had the most aroma? Which sample had the most flavor? Which sample was the most bitter? Which sample did you like the best? Once the conference concluded we counted the responses and were surprised by what we found. Last week when the Switchback crew sampled these beers at the brewery, the beer brewed with Wolcott hops from Wolcott, VT was the clear favorite. We were expecting similar results from the hop conference questionnaires, but found there was a new favorite. The Annual Hop Conference attendees ranked the beer brewed with Northfield hops the highest in every category. They felt it was the most bitter, had the most flavor and aroma and was overall the most enjoyable to drink. While only 32% of the Switchback crew said they would enjoy drinking a beer brewed with the Northfield hop, its popularity at the conference shows that it certainly isn’t out of the running to one day be a commercial hop variety. Taking on an intern and working with the UVM Extension has been a blast! We are thrilled to have had the opportunity to learn more about what is required to produce a commercially viable hop. Thank you so much to all who helped with this project and to everyone who followed along with the story. Cheers! If you’re just tuning into this developing story, you’ll want start with Part 1 here. Together with the UVM Extension NW Crops & Soils Team and our intern, Lejla Mahmuljin, we’ve taken on the mission of learning just how commercially viable some of Vermont and New England’s native grown hops are. Over the past few weeks, we brewed three test batches utilizing historical hop varieties. The whole cone hops we used in each brew were grown using rhizomes (root structures) harvested from wild hops found in locations around New England. We don’t know the exact history of these hops, but we suspect that they are remnants from pre-prohibition commercial hop farms. We brewed three beers using three different varieties of native hops: Kingdom from Tunbridge, VT, Northfield from Northfield, MA, and Wolcott from Wolcott, VT. In addition to this, we brewed an IPA using Cascade hops as a control, a hop we are very familiar with and utilize in many of our recipes at Switchback. Every Friday, the brewery crew participates in a weekly tasting panel. During one recent Friday tasting session, we sampled the test batches that utilized these historic wild hop varieties to see just how much potential we felt they had for commercial brewing. We asked the team three questions: (1) would you enjoy drinking a beer brewed with this hop? (2) on a scale of 1 to 10, 1 being the least bitter and 10 being the most bitter, how bitter do you think this beer is? and (3) describe the flavor and aroma characteristics imparted by this hop. From there, our lab Technician, Ellen Dillenbeck, and our UVM intern, Lejla Mahmuljin, collected and analyzed the results from the panel. The staff’s clear favorite was the Wolcott hop variety with two thirds of participants saying they would enjoy drinking a beer brewed with them. The other brews were not as well received. Only 44% of the team said they would enjoy drinking a beer brewed with the Kingdom hop. The Cascade and Northfield hopped beers tied for the lowest ranking with only 32% of the crew saying they would enjoy drinking a beer brewed with either of them. Our team described the Wolcott variety as fruity, citrusy, tropical and floral with some piney notes. They thought the Northfield variety tasted herbal and tropical with some fruity, citrusy, piney and, unfortunately, sweaty notes. The crew also thought the Kingdom hopped beer was very herbal, with a strong floral flavor and aroma as well. The Cascade hopped beer was described as spicy, piney, citrusy, herbal and floral. 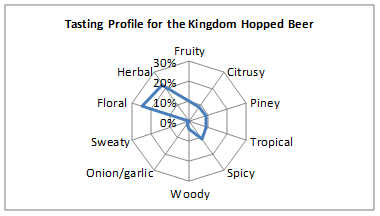 On average, the team ranked the Kingdom hopped beer as the least bitter, only a 4.67 on a 1 to 10 scale. This was not a surprise given that it had the lowest IBU count of all four beers. The Cascade was ranked the most bitter, a 6.59 on a 1 to 10 scale. Again, this was not surprising as Cascade had the highest number of IBUs. The team thought the Wolcott hopped beer was the second most bitter, a 5.78 out of 10, and the Northfield was the second least bitter, a 4.94 out of 10. Although there was only a 5 IBU difference between the two beers, we had expected the Northfield beer to taste more bitter than the Wolcott brew based on its IBU count. On February 21st, Ellen and Lejla took their findings and presented them at the 2019 Vermont Hop Conference in South Burlington, VT. Guests were also invited to try samples of the brews and record their thoughts. Stay tuned for part 3 of this story, where we’ll share what they all thought of these historic hop varieties! Vermont and hops have a long history. In the 19th century, Vermont was a hotspot for hop growth and cultivation. During prohibition the demand for hops disappeared and farmers focused on growing more profitable products. Today, the vast majority of hops are grown out west, but finally, after many years, Vermont farmers are once again growing hops commercially. They face many challenges including pests, diseases, and volatile weather conditions. While Vermont may no longer be a major player when it comes to hop farming, scientists and farmers are collaborating to develop methods for success. Hop plants can be seen growing wild in several locations around Vermont including Wolcott, the Northeast Kingdom and Northfield. So what are we doing with these wild hops? Together with the UVM Extension NW Crops & Soils Team and our intern, Lejla Mahmuljin, we’re making it our mission to find out just how commercially viable these hops are. Are they good for brewing? What’s their flavor and aroma? What characteristics do they impart to the beer? These are all questions we’re working to answer. To kick it off, we brewed four different SMASH (single hop and single malt) beers on our 10 gallon pilot system. Next, we’ll be running them by the crew during our company tasting panel. Check back to see the results!